What It’s About: Belle (Josette Day) asks her father (Marcel Andre), traveling on business, to bring her a rose as a present. When he takes one from the supernatural abode of the Beast (Jean Marais), the Beast gives him two options: pay with his life, or with the life of one of his daughters. Belle feels responsible and takes her father’s place, only to discover that the Beast does not want to kill her, but to marry her. The Beast will come to her every night and ask her and Belle vows to refuse…but is there more to the Beast than his hideous (or really, adorable) cat-like appearance? Why Watch it Today? : Poet, novelist, painter, playwright, set designer, actor, and director of today’s film Jean Cocteau died 50 years ago today. Cocteau directed a small number of films in total, but they were highly influential and are beautiful to watch. 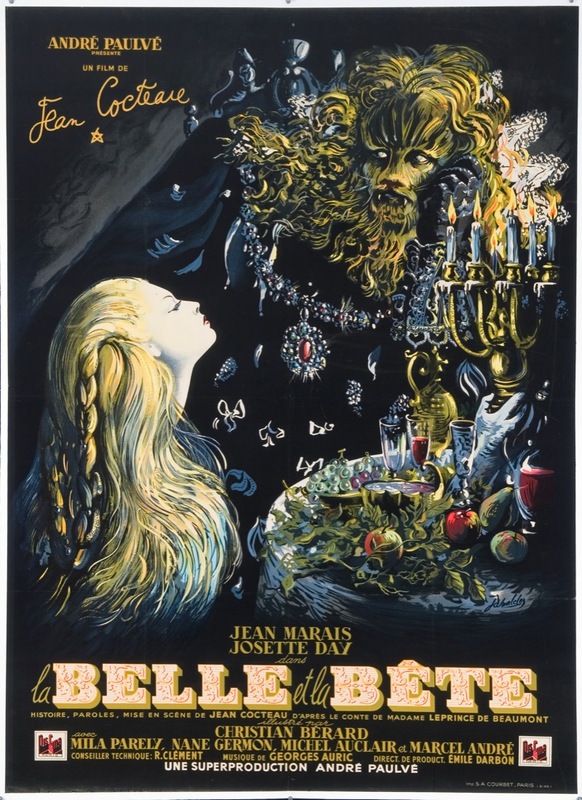 Cocteau’s telling of this well know fairy tale is haunting, from the somewhat disturbing servants in the Beast’s castle (hands jutting out from walls to hold lights, for example) to the Beast’s fantastic makeup, to the amazing use of light and shadow. The tale benefits from Cocteau’s decision to leave the sharp edges of the original tale in. This entry was posted in "Foreign Film", Adaptation, Arthouse, Based on a Folk Tale, Black and White, Drama, Fairy Tale, Fantasy, Movie of the Day, Romance and tagged castle, curse, evil sisters, fairy tale, father, father-daughter relationship, forest, France, Jean Cocteau, magic, robot servant, rose, twist. You must be psychic, as I happened to dig out the the 1991 VHS version of this and another SEACAM film I can’t watch, Les Orgueilleux earler yesterday for a quick article. I actually didn’t know Cocteau died on this date, so thanks for the info! Glad I got you some useful info, and I’m happy to have some good timing-that is always fun. In grade school this would have creeped me the hell out. We had films that were shown during assemblies, but they were mostly understandable-a Flinstones episode, some Warner Brothers cartoons, a short with a teddy bear in a department store, a kid who lives in a high rise who buys a fish, The Red Balloon, and a few others. About as creepy as it got was a barely animated version of The Headless Horseman (this one: http://www.youtube.com/watch?v=IqEi3SO3gPE) -not Disney’s-and one where a kid and his mom move to a new home-that already has a witch living in it. But she turns out to be a good witch, and helps them. Oh! They also had the school short versions of the Universal classics, and we saw those some Halloweens. Which was a great joy for me as a kid.